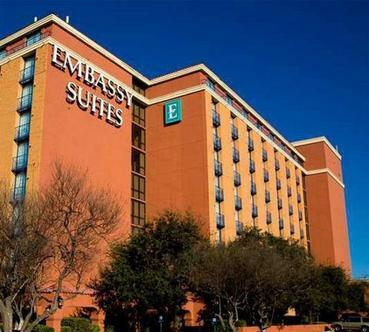 About the Embassy Suites Austin - North HotelLocated in Austin's North Corridor, the Embassy Suites Austin - North hotel is situated just minutes away from countless city attractions, corporate centers and government agencies. Vacationers and business travelers alike can enjoy convenient access to: Austin's congressional and entertainment districts, The University of Texas campus, Austin's Convention Center, The Texas State Capitol, Austin Children's Museum, 6th Street Austin, Austin Arboretum, Austin-Bergstrom International Airport, IBM, Freescale, Dell Computer, Applied Materials.To help guests take advantage our hotel's prime location, we offer a courtesy shuttle service within a two mile radius of the Austin hotel. And, as our Embassy Suites hotel is situated only 3.5 miles from downtown, Austin's famous music and nightlife districts are just a short cab ride away.While at our Embassy Suites Austin - North hotel, you'll be treated to a range of superb services and exquisite settings: each of our spacious, two-room hotel suites is beautifully decorated with a private bedroom and spacious living room, assuring your comfort and convenience with outstanding hotel amenities. Guests can enjoy: A private wet bar, refrigerator, microwave, coffeemaker and complimentary coffee and teas. Hairdryer, iron and ironing board. Two televisions, HBO, Pay-Per-View and Nintendo games. Two telephones with modem hook-up, voice mail, and wireless high-speed Internet access (available at a minimal fee).Our Embassy Suites hotel in Austin also offers a range of leisure and convenience facilities, inclusive of: An indoor hotel pool, whirlpool and sauna, A newly expanded, fully equipped, 24-hour exercise facility, Onsite restaurant and hotel lounge, 24-hour fax, hotel business center and ATM services, Hotel guest laundry and same-day dry cleaning services, Hotel airport shuttle service (reservation required), To start each day off right, we offer a complimentary, cooked-to-order breakfast at the hotel. In addition, guests can enjoy lunch and dinner at our very own Lynx Steakhouse, featuring an extensive Continental menu with regional specialties and American favorites.The Embassy Suites Austin - North hotel also hosts a nightly manager's reception, inviting guests to unwind from touring Austin's local sites or engaging in business. And our Lynx Lounge - offering music, sports, news, your favorite hors d'oeuvres, and beverages - is the perfect place to conclude the evening while planning your next day's adventures in Austin. Arranging an event? Our all-suite downtown Embassy Suites hotel is an excellent place to host your next Austin meeting, sales retreat, banquet or reception. Whether you're gathering with a group of 10 or 400, we have the ideal space for you in Austin We offer: Nearly 10,000 square feet of flexible hotel meeting space, inclusive of an elegant ballroom, meeting rooms, boardrooms and a garden atrium. Additionally, all our hotel suites in Austin accommodate small groups of 4-6 guests and are fully equipped with meeting features. Full audio/visual equipment, Private hotel dining and lounge area, Catering services for hotel receptions and banquets. We also reward corporate and event groups with hotel meeting room discounts and other specialty packages for stays in Austin.Whether you're traveling to Austin on business or for pleasure, the Embassy Suites Austin - North hotel will ensure your stay in the city is truly exceptional.